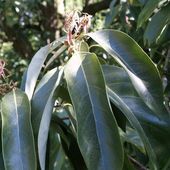 Caerhays has an exciting collection of Chinese oaks many of which are historic plants from seed collected in the wild by the great plant collectors. Even those very familiar with the garden at Caerhays will probably hardly have noticed them but they represent an important part of the history of the garden and how it has evolved. 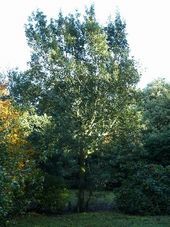 Some of them are extraordinarily rare, some are record sized trees and a few represent the only mature trees of their particular species which exist in Western Europe. 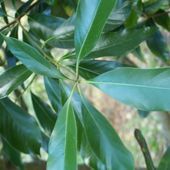 Although rarity and dullness often go hand in hand the Caerhays collection of evergreen oaks may well be of interest to the plantsman or collector who is keen to learn more about oaks. 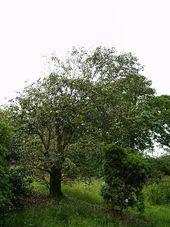 Caerhays is a member of the International Oak Society, an international group of Quercophiles who have a common interest in the genus. This list follows the conventional route which garden visitors would normally take around the garden. Very few of these oaks stand out or demand attention so the visitor will need to be observant and follow the location map available at the Sales Point. For obvious reasons non evergreen or deciduous oaks have been ignored. This is a native of S. China, Laos and Japan. It was first introduced into the UK by Robert Fortune in 1854. It grows at Caerhays as a windbreak and a very effective one it is too. The windbreak was planted in 1928. You can cut it down and it reshoots effectively from the base. It develops small acorn clusters but these have not been known to go on to form mature seed at Caerhays and it is difficult but not impossible to propagate from cuttings. 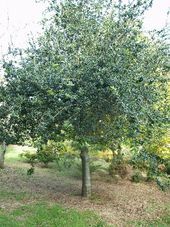 A simple hybrid between Q. ilex, the evergreen or ilex or holm oak and Q. robor, the English oak. As you would expect from its parentage this hybrid oak holds some of its leaves through the winter. It was named after a Mr Turner, a nurseryman from Essex, in the late 18th century. This is another semi evergreen oak whose remaining overwintered leaves usually fall early in the New Year. It was raised by a Mr Lucombe in his Exeter nursery in 1762. The cross was Q. cerris, the Turkey Oak with Q. suber, the Cork oak. Hence, again, its semi evergreen nature. The plant in the Auklandii Garden was nearly dead when planted in a ceremony marking my father’s retirement 9 years of chairing Cornwall County Council but it was just rescued in a very dry summer by judicious watering although it dropped all its leaves and looked dead for some while. This species is a native of China and Japan and was introduced to the UK by Oldham in 1861. The largest plant arrived at Caerhays in 1920 from Wakehurst Gardens. By 1966 it measured 23 feet with a girth of 1 foot 8½ inches (i.e. about 3 feet from the ground which is the correct procedure for measuring trees). One of the trees at Kew which was grown from seed collected by Oldham was 26 feet x 2½ feet in 1972 and another, probably from seed collected by E.H. Wilson in 1908, had reached 23 feet x 2½ feet in 1972. This plant propagates from cuttings easily.It will also withstand a great deal of wind and salt laden gales. This is a variable species with a very wide distribution from Japan and Formosa to China and the Himalayas. 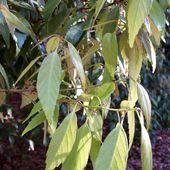 Despite this, it is still rare in cultivation, and one does rather wonder why as it has the most attractive leaves which are as its name implies. J.C. Williams thought it should be sub divided into sub species and refers to 3 different plants at Caerhays of which only the one survives today. It was introduced in 1804 from Nepal and in 1861 by Oldham and subsequently by Ernest Wilson. Two plants came to Caerhays in 1919 from Veitch’s famous nursery in Exeter and 1 in 1920 from Wakehurst. In 1971 the Caerhays plant measured 20ft. x 1½ft. and in 1984, 36 x 4½. It is very much smaller today as the main tree has failed and only a side shoot from the base remains. The original Caerhays tree was destroyed in the hurricane of 1990 but a welcome replacement come as a gift from John Bond at Windsor Great Park soon afterwards and is now 20 or more feet tall. This oak was first planted at Caerhays in 1917 and came from a Nursery in York. It was then called Q. mirbeckii but subsequently died out. The plant you can see in the garden today was only put in 2000. It is the Algerian oak which forms a handsome large tree with fissured bark. It was originally introduced from N. Africa or Spain in 1845. In the wild this tree is recorded as growing 120 feet tall with a 15 foot girth. It is a native of the Himalayas from Nepal to Assam and discovered there in 1802. 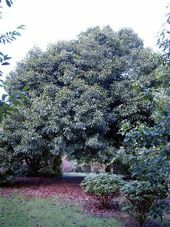 Caerhays has the only recorded mature specimen in the UK from seed collected by George Forrest on the Burma/Yunnan border in 1924 (Forrest collectors number – 24183). It is quite tender and has been frequently cut back by fairly mild frosts but still manages to reshoot from lower down the stem. The Caerhays tree has never set seed but it does flower. Occasionally cuttings have been grown but the smaller plants seem even more tender. The Caerhays tree measured 32 x 3½ ft. in 1966 and 42 x 4¾ ft. in 1984. It is not that high today as a result of the snow and frosts in January 2009. Another unique plant which does not exist anywhere else in the UK as a mature plant. It is again a plant which produces flowers but no acorns have been found to date. The cuttings callous up but never seem to root out which is very frustrating. Tissue culture ought to be the answer but, as propagators now know, those plants which are impossible to grow from cuttings or seed are just as impossible in the laboratory. Dull and rare really do meet in this historic plant. It was 27′ x 1’9″ in 1966 and I rather doubt that it is very much taller today although, now that more light reaches its trunk, this has produced many new shoots nearer the ground. Tom Hudson of Tregrehan and Nigel Holman of Chyverton in Cornwall collected this species in Burma in the early 1990’s. Seedlings have been grown on at Caerhays and Burncoose and are now about 10 feet in height and doing well. However the leaf form does not resemble the original Caerhays plant that closely. Perhaps this is immaturity or perhaps this species too is quite variable. Perhaps the most popular and attractive of all evergreen oaks and one of the easiest to propagate. Four of these trees arrived in 1920 from Dickinsons of Chester. Several, if not all of them, survive today. The largest measured 40′ x 5’1″ in 1966. By 1971 this tree was 42′ x 5’6″. The species was introduced from Japan in 1878. It is strange that it is not more popular especially when you see its key feature which is its bright green young leaves which emerge in May and June. 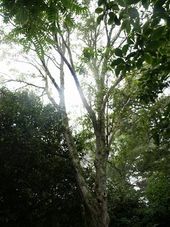 The largest tree at Caerhays has so dense a canopy that any visitor would be quite safe in a thunderstorm. This oak suffered in the severe winter of 1963 but grew aerial roots and rejuvenated itself despite very severe dieback. Planted at Caerhays in 2001 this is a tender small tree or large shrub in the UK although it can reach 80 feet in the Himalayas up as high as 8,000 feet. A plant at Trewithen measured 62′ x 3’9″ in 1985. The previous plant at Caerhays was collected by George Forrest in 1924 land measured 28′ x 1’6″ in 1966. This species was also collected by Kingdom Ward in 1933. This plant has always been known by this name at Caerhays. 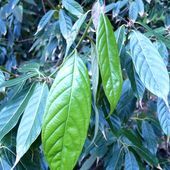 However Alan Coombes, the senior taxonomist at the Hillier Arboretum, believes it to be Q. acuta which does seem to be stretching credulity if one is able to look closely at samples of both sets of leaves. The botanists now maintain that Q. cuspidata is in fact Castanopsis cuspidata. Castanopsis are evergreen trees related to oaks and sweet chestnuts but they are mainly tropical or sub tropical. J.C. Williams certainly thought he had Q. cuspidata and described it as ‘a nice tree but whether it will make 30 feet I do not know’. Another semi evergreen oak species or semi evergreen for part of the winter at least. 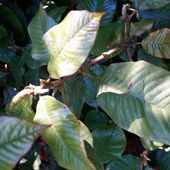 The Caerhays plant is more of a shrub with splitting leaders and lots of side shoots. The leaves are edged with bristle tipped teeth more like a holly. This species comes from Japan and Korea and was again introduced by Oldham in 1862. This species has especially beautiful bark and comes from the S.E. United States. It was introduced to the UK in 1880. It tends to drop all its leaves in the spring just or even before the new growth emerges. The difference in leaf formation between American evergreen oaks and Chinese ones are certainly apparent when you look at this species. You might say that the American ones at least look like oak trees! Despite being evergreen the tree does also have attractive autumn tints. This is undoubtedly one of the very best windbreaks for any coastal garden. It is quite happy in the most dense salt spray. It lives far longer than Pinus insignis which is the other favourite tree for coastal windbreaks in Cornish Gardens. 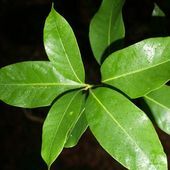 The tree is variable in its leaf shape and form in various parts of the Mediterranean. 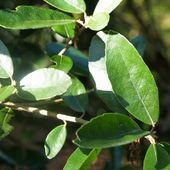 Q. ilex drops its leaves in May/June just after the new growth emerges which can be tiresome on roadways or paths but is a small price to pay for withstanding the wind without splitting and losing limbs. This article concentrates only on those mature evergreen oaks which visitors can go and look at. Those that have died out include Q. chrysolepis which we have recently tried again to get going. Q. suber, the Cork Oak which we have tried at least 3 times in the last 10 years seems to dislike our high rainfall even though there is an outstanding specimen at Tregothnan Arboretum which must be nearly 100 years old. 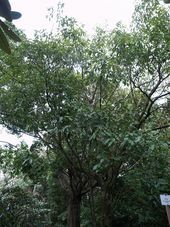 Lithocarpus are the very close relatives of Quercus. There are 300 species in all and all but one come from South and East Asia. The key difference with oaks is that they have erect flowering spikes rather than trailing ones. 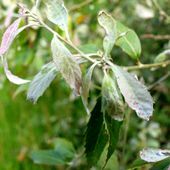 The exception is the Tan Oak, Lithocarpus densiflorus which comes from California and is the main victim of the so called Sudden Oak Death (SOD) all along the Californian seaboard. You will therefore not be surprised that this is not a plant which we grow at Caerhays. When these oaks arrived at Caerhays the collectors did not realise that botanists would spend the next hundred years arguing about their proper classification. The old records show them as oaks whereas now we are now required to know them as lithocarpus. The most interesting feature of this tall growing Himalayan tree are its fruits which are described as “resembling colonies of great barnacles”. Only the very largest in any cluster are in fact viable and the seed take 2 years to germinate. There are several mature plants at Caerhays. The largest was 59′ x 5′ in 1984 and may well be nearer 70′ today. The young plants do also set seed which is so heavy it can snap the branches on which it is being produced. This tree was introduced from Japan in the first half of the 19th century. It is said to be quite hardy in South London where it sometimes produces fertile acorns but it has not done so at Caerhays as yet. This Lithocarpus is very easily confused with Quercus glauca and the botanists have much fun here at the expense of keen plantsmen. There is nothing at all in the reference books about this species but looking at the pictures you will see how attractive the new growth is. The species comes from China and Taiwan but was only named for us in 2001 by Dr. Zhou after we had sent material for identification to Kew. This is a native of Hupeh and West Szechuan and was a Wilson introduction in 1901. The Caerhays tree measured 52′ x 3’3″ in 1975 and came to Caerhays from Kew in 1921. In great old age this very rare tree has suddenly started producing just a few acorns or perhaps we are just starting to notice them. Visitors may be able to see the erect upright flowers at the very top of the tree in April or May. Occasionally cuttings will root and we do have another young tree coming on well which is now about 20 feet tall and 15 feet wide but this species does not like the wind and the young tree is very exposed by a new planting. This species was collected by Wilson in W. Szechuan in 1901. The mature tree at Caerhays measured 58′ x 5’6″ in 1966 and 72′ x 6’9″ in 1984. This is the most peculiar Lithocarpus of the lot. It was thought to be almost unknown to science. However, a Korean oak specialist nearly needed medical treatment when he saw it and finally gave us the correct name. It would be fair to say that we guessed it was a shrubby oak but had no idea of its name. Apparently it will root from fleshy cuttings taken in early summer and it is good news indeed to report that we have just planted out our first new young plant. This is a tender species which has been killed back to ground level more than once by frost and cold in the last 40 years but it survived the 1990 hurricane intact although little else around it did. 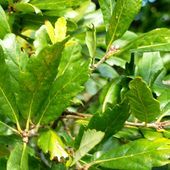 To the list of Caerhays evergreen oaks must now be added the exciting new range of semi evergreen oaks from Mexico sent to us by the Hillier Arboretum. They may be too tender for us to grow but only time will tell. Perhaps Hilliers gave them to us knowing that they would be impossible in Hampshire. In all we planted 66 new oaks in 1999 from this source and 27 species (evergreen and deciduous) in the last 3 years. More exciting still has been the very recent arrival of 6 more new species from Burma and Indo-China. Gardening on the scale of Caerhays is never static. You have to try new and untried species as our forebears did over 100 years ago. Cornwall can never escape disasters of weather or falling trees. The key point is, however, that a living collection must never rest on its laurels. Some oaks will hate our high rainfall but others may find Cornwall as attractive as the Himalayas. That is the challenge and fun of collecting plants.